An amputation involves the surgical removal of part or all of an extremity. Amputations can involve fingers, toes, feet, hand, arms or legs. The higher the amputation, that is, the closer to the core of the body, the greater is the impairment the individual suffers. Nearly two million Americans are suffering from having an amputated body part at the present time. The most common type of amputation performed today is an above or below the knee amputation. Why would an Amputation be Necessary?Amputations are usually done in a surgical setting, with the exception of amputations done in the field when a person has become trapped under a heavy object or in wartime, when a leg or arm is mangled and must be cut off to save the life of the person with the injured extremity. Most amputations are done for medical reasons, which can include poor circulation to an affected body part. People can suffer from poor circulation due to blocked arteries leading to the extremity or because of frostbite that has damaged tissue and impaired circulation to the feet or arms. If a body part is without circulation for a period of time, the tissue dies off and infection becomes inevitable. 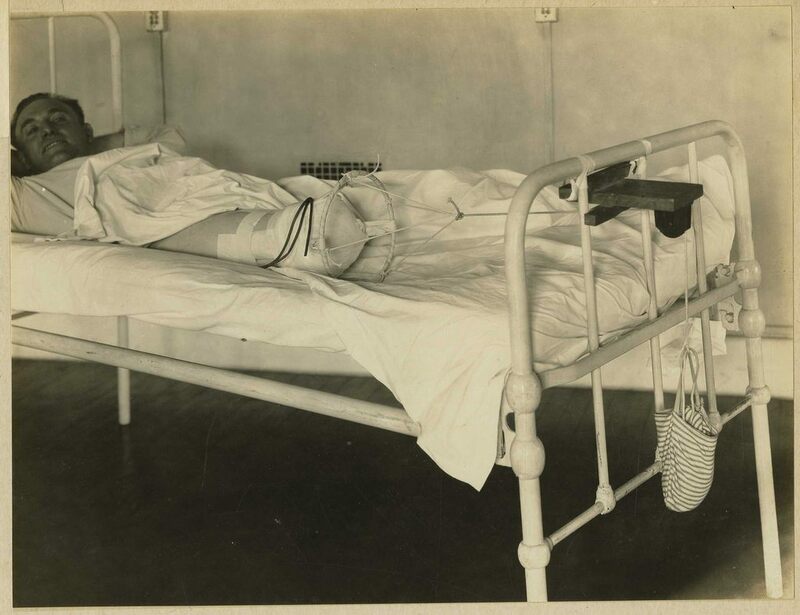 Rather than attempt to live with a large area of dead tissue, the amputation is performed to save the person’s life. The amputation procedure is done in a hospital with an average length of stay of between 1 and 2 weeks. All damaged tissue is removed at once in some cases, while in others, successively higher amputations are done when it is not clear where the healthy tissue stops and the diseased tissue begins or when an amputated stump fails to heal at the level it was cut at. The goal is to leave behind as much healthy tissue as possible. The doctor does several things before determining where to amputate the extremity. He or she will look for the presence or absence of a pulse where the cut is being made. This means that the area is getting enough circulation. Dead tissue tends to be colder than living tissue, so the doctor checks this as well. Good tissue has good sensitivity to touch or pinprick, whereas dead tissue is insensitive to touch. If bone is crushed as part of an injury, this is generally part of what is removed as crushed bone doesn’t heal well. During the amputation, areas of bleeding from arteries and veins are sealed off. The sharp ends of the bone are smoothed and curved so as to be able to accept a prosthetic devise. All potentially diseased tissue is removed either in stages or all at once, depending on the circumstances and on what the disease is all about. In a closed amputation, the muscle is placed over the end of the bone and muscle tendons are attached to the bony stump. The extra muscle available covers the end of the bone in order to relieve the pain and pad the end of the stump as much as possible. In a closed amputation, the doctor often puts drains in the area of the stump so that blood and serous fluid can drain out as the amputation heals. Firm dressings are placed over the stump to prevent swelling and promote healing. The limb may have to be elevated in traction for a period of time so it can heal properly. In an open amputation, the wound is dressed but the skin is not closed. Amputations are done this way when it is unclear as to the final level the amputation will eventually be. Dressings are changed often and the residual stump is inspected to see if it is healthy or not. As the amputation heals, the patient is referred to occupational therapy, physical therapy, and prosthetists who will work to get the patient’s extremity functioning as close to normal as possible. Medications are given to control pain, including phantom pain, and work with a prosthetic can begin within 10-14 days after a closed amputation has been achieved. Closed amputations usually heal fully by about 4-8 weeks, although there are functional and psychological issues that require attention for many months or even years after the initial amputation. Assistive devices and prosthetics can change over time and a person can have different prosthetics for different reasons. Leg AmputationsLeg amputations can be”minor” or major. A minor amputation involves part of the foot or a toe. Even disarticulating the foot from the rest of the leg (called a Syme’s amputation) is considered a minor amputation of the leg. Major amputations include below the knee amputations that are above the level of the ankle, above the knee amputations, and knee or hip disarticulations. Even hemipelvectomies can be done, which remove part of the person’s pelvis or hindquarters as part of the amputation. Arm Amputations Arm amputations can be minor or major as is seen in leg amputations. Minor amputations of the arm include amputations of the fingers, thumb, metacarpal bones and disarticulation at the wrist. Major amputations include disarticulation of the elbow, below the elbow amputations, shoulder disarticulations, transhumeral (above the elbow) amputations and amputations of the forequarter. The Procedure ItselfWhen an amputation is performed, the doctor ligates (ties off) the supplying arteries and veins so that the person bleeds less. The muscles are cut through along with tendons and connective tissue. Finally the bone is sawed through. The rough ends of the bone are smoothed, muscle is placed over the bony ends to pad the stump and some parts of muscle is attached to the end of the stump in order for the muscle to move. The skin is then pulled over the entire stump and closed so that there is a relatively insensitive scar that is able to accept a prosthetic device.